as you probably noticed, there has not been much dyeing over here lately. and i just used up all of the dyed roving, so the other day i lugged 2 huge black garbage bags labeled drum card up from the basement and started sorting bits and bobs into 4 oz bundles (i had over 10!). too much fun… and now i’m spinning them :) one a day until wednesday, then they soak to be all ready for the craft fairs coming this weekend. but before i let myself spin the ones we carded last night, i really must do the dishes. 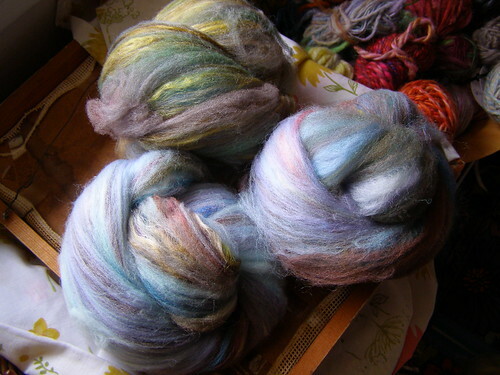 This entry was posted in carding, cosyknitsliterally, cosyspins, craftfairs, handspun, spinning by cosymakes. Bookmark the permalink. What gorgeous little nuggets of fluffy goodness! lovely! can’t wait to see the handspun that comes out of this fiber! I like the muted colors. Have fun spinning them up!